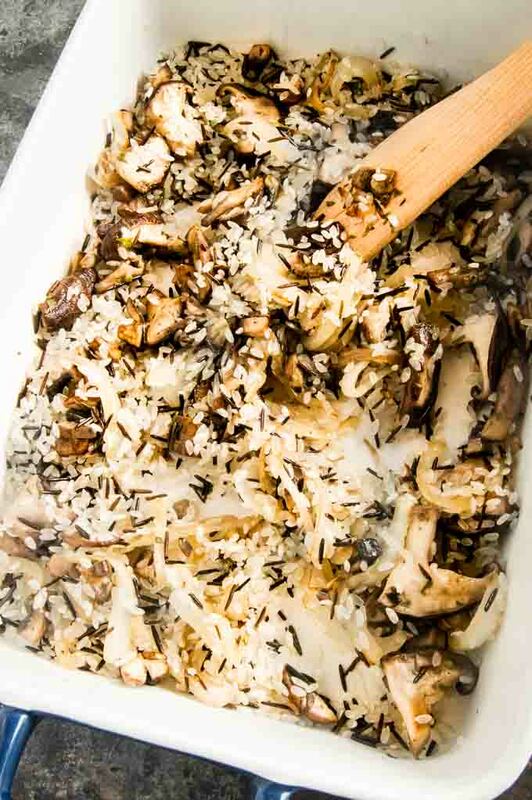 Fluffy, fragrant rice with crunchy edges make this Mushroom Rice Pilaf recipe a great weeknight side dish or fancy enough for a dinner party rice side. You know a recipe everyone says is their own it’s a great one! The rice pilaf is easy enough to have for a weeknight dinner or fancy enough to serve for a dinner party side dish. What is the difference between regular rice and a rice pilaf? Regular rice is generally made with water as the liquid and can be either, boiled, steamed or baked. A rice pilaf is made with a seasoned liquid such as a broth or stock. Usually the pilaf is baked in the oven. Rice pilaf starts with some aromatics such as onions and mushrooms in this case. You want to saute them in a little butter to really bring out the flavor. Once they are ready you’ll add the rice in and stir to coat all the rice in a little butter too. Making sure each piece of rice is coated in butter makes for very moist pilaf, versus a much too dried out pilaf that makes you want to have a drink of water to wash it down after taking a bite. By continuing to heat the rice you also toast the rice a little bit which brings out a nutty flavor in your pilaf that makes it feel very much a comfort food. This recipe is very versatile. Actually you could make a pilaf with anything you have in your house. 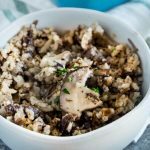 This Mushroom Rice Pilaf is a little more hearty because it uses the creamy mushroom soup, but you could also use chicken broth as the liquid or make it strictly vegetarian by using vegetable broth. To make Vegetarian Pilaf for a main course offering for your guests you can use a vegetable broth and double the mushrooms in the recipe. You can sub a good olive oil in place of the butter as well. I promise your company will go away very well satisfied and not hungry at all. 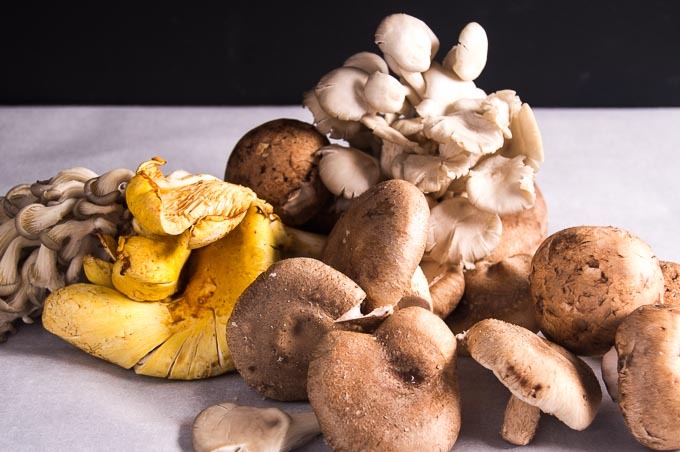 I’ll buy a variety of special mushrooms such as porcini, shiitake, chanterelles and Miatake to have a very impressive vegetarian option. I’ll often use whatever we have on hand to make a Rice Pilaf for a dinner party. The most important thing when adding things is to be mindful of the boldness of the flavor. Remember, its better to have a few flavors that really stand out than have so many flavors happening that you cant distinguish what you are eating. Looking for other Mushroom or Pilaf Recipes for side dishes? While a Rice Pilaf can be a hearty main course you can also serve it with so many other things as a side dish. It pairs well with all meats. Some suggestions for you: Lemon Blossom’s Lemon and Herb Chicken Thighs, Natasha’s Kitchen’s Simple Baked Salmon, this recipe for Horseradish Crusted Rib Eye , Roast Cuban Chicken, or these simple grilled lamb chops. PIN THIS for easy reference when you need a easy, delicious side dish! 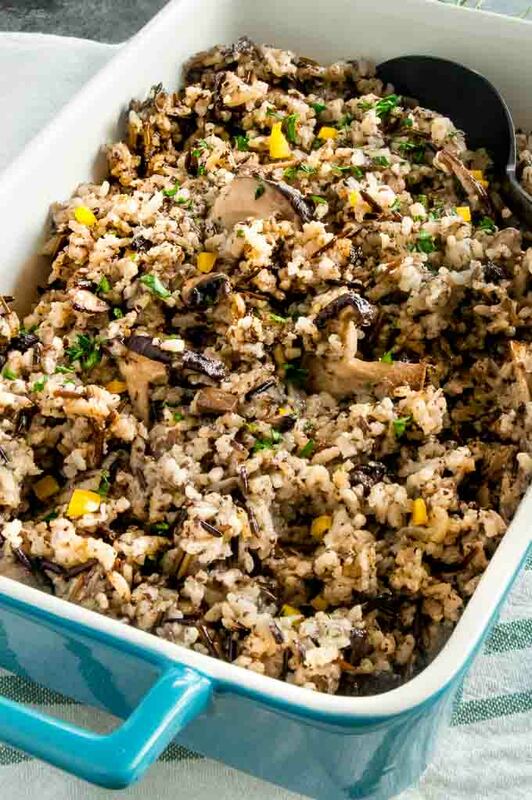 Fluffy, fragrant with crunchy edges make this Mushroom Rice Pilaf recipe a great weeknight side dish or fancy enough for a dinner party side dish. In a saute pan on medium heat, melt 2 tablespoons butter and saute the onions for 2 minutes. 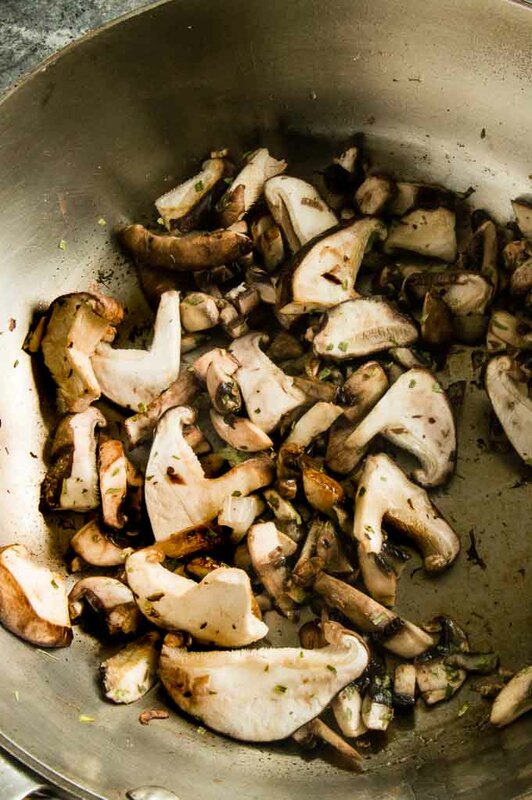 Then add the mushrooms and saute until they have softened and released their juices. (about 5 minutes). Add the remaining butter. Once butter has melted add the rice and stir until all the rice is coated with butter. Add the mushroom soup and chicken broth and stir. Either bake in the saute pan or place in a baking dish. Fluff rice and serve immediately. If you are using canned condensed mushroom soup instead of homemade, use one can plus one can full of chicken broth or water as a sub. To make vegetarian use vegetable broth instead. To serve as a main course option double the amount of mushrooms and onions in the recipe for a hearty dish. Each of your family members claiming this recipe as their own is hilarious and speaks loudly of the quality and great flavor of this pilaf. I love mushrooms so this one is a recipe I have to make soon! Very elegant also – love it! I’m a fan of adding nuts to rice pilaf and love that you included a vegetarian option for us! This is such a simple recipe and goes with just about everything. 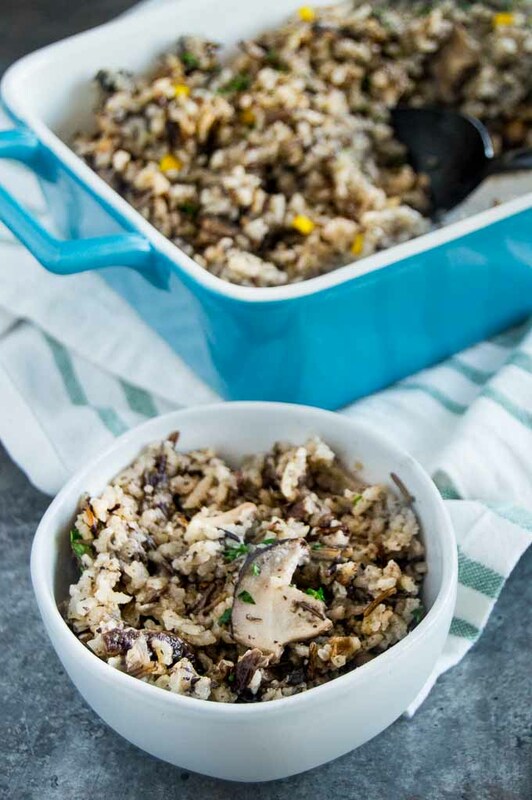 We enjoyed this mushroom rice pilaf with cod and not a bite was left! My husband is obsessed with anything mushroom so I had to make this as a special treat for him. No surprise, he loved it! I added slivered almonds I toasted and it gave a nice texture to the dish. Thanks so much for this recipe!